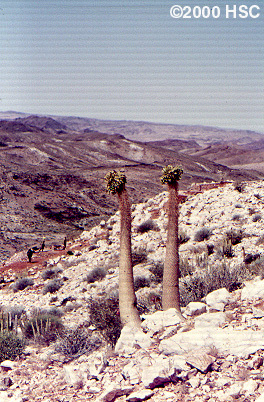 Namibia is home to the majority of the Namib Desert and the plant Welwitschia mirabilis, along with a great diversity of other regions and organisms. 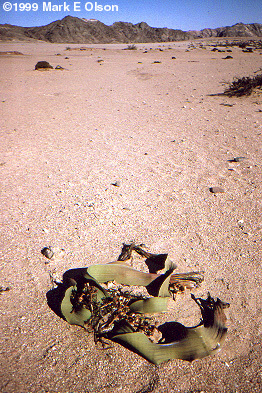 To see more images of Welwitschia, go to the Welwitschia Page. 1. Welwischia mirabilis, one of the world's strangest- looking organisms. 2. 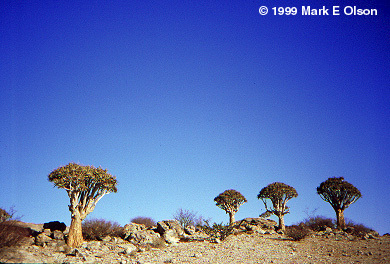 A small grove of Aloe dichotoma (Aloeaceae) at the eastern fringe of the central Namib Desert. 3. 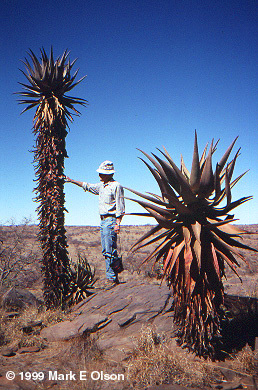 An unbranched species of Aloe on the Khomas Hochland plateau west of the capital, Windhoek. The person in the photo is my dad! 4. A giant member of the Grape Family (Vitaceae), Cyphostemma currori, close to the previous locality. 5. 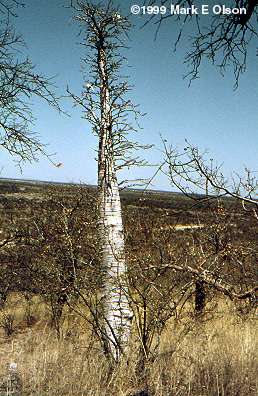 The tall bottle tree Pachypodium lealii in northern Namibia. 6. 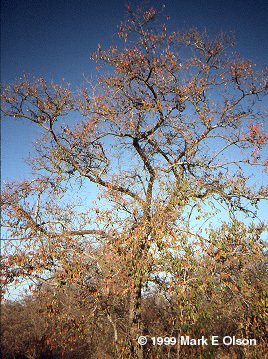 The legume (Fabaceae) Colophospermum mopane is one of the most important trees in many parts of southwestern Africa. 7. 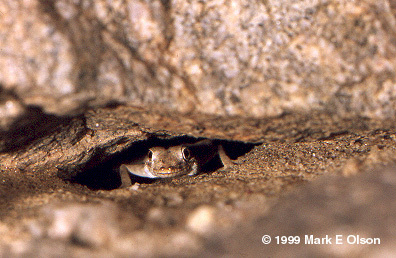 Symphoristachyssp. 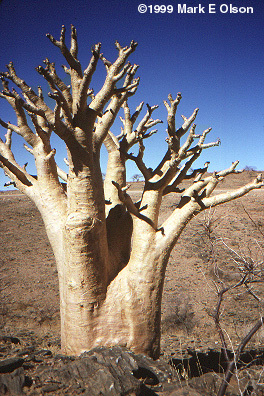 in the Euphorbiaceae, from northern Namibia. 8. and 9. 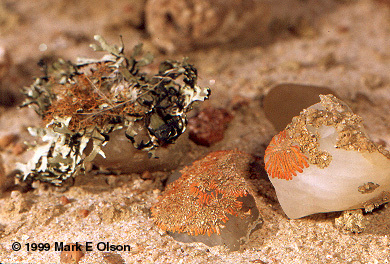 Large tracts of the Namib Desert are dominated by rich communities of lichens, some of which form an easily-damaged crust on the soil surface, while others grow on rocks or unattached. 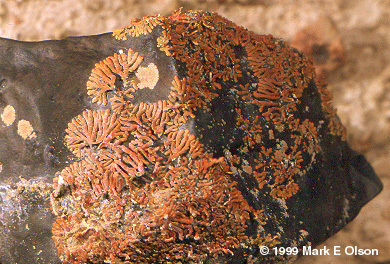 7. shows 3 or 4 species of lichen growing on rocks, while 8. shows one species of reddish lichen growing on a rock covered with desert varnish. 10. and 11. 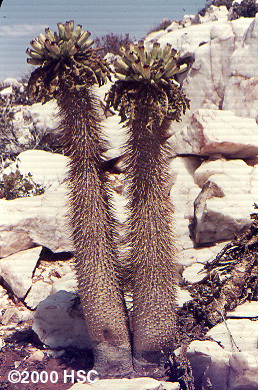 Pachypodium namaquanum (Apocynaceae) in southern Namibia. These images are from the Horwood slide collection. More images from this collection are on the Somalia Page. 1. 2. 3. 1. and 2. 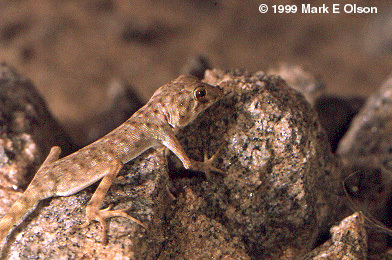 Tiny gecko (Rhoptropus?) in the central Namib. 3. 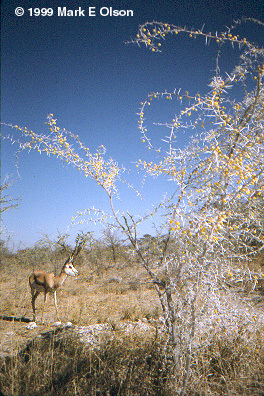 Springbok (Antidorcas) in northern Namibia. 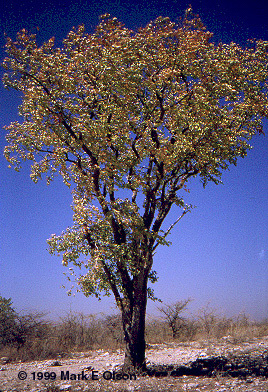 The flowering shrub is Acacia nebrownii (Fabaceae).